Christmas is a great time for books. My friends and family make sure that I receive at least a few gift wrapped paperbacks every year, and many of them have impeccable taste when it comes to non-fiction. I've always been especially grateful for receiving books, that I wouldn't normally even consider reading, as presents. Another reason I love the holiday season (and hate that it's now over) is that I rarely have time to read more than during the Christmas break. Since my late teens, weeks with nothing to do have been hard to come by, and these days with all the frenzied studying and work going on, I can only hope to get 20 minutes of reading done just before I fall asleep on the couch in a state of serious fatigue. Christmas is different, however. Last year I managed to finish Jonathan Franzen's Freedom in three days of blissful reading coma. This year was no different, and I managed to load up on enough good reading to get me through the worst of this winter. The first on this list was Nudge by Thaler and Sunstein, which many of you have undoubtedly heard of already, if not actually read. 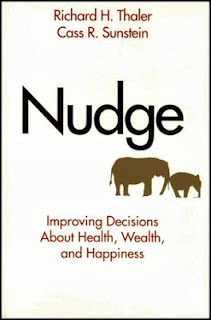 Nudge is about influencing people through public policy and something called choice architecture. Choice architects are people who create systems, where others are forced to choose between alternatives. For example, you might have noticed those check boxes at the end of Internet forms, where you are given a choice whether or not to subscribe to a weekly advertisement newsletter. Turns out that the default choice (i.e. whether the box for the newsletter is pre-ticked or not), has a huge impact on our decisions. People are immensely influenced by how choice situations are arranged. Test where people are required to choose between complex (or sometimes fairly simple) alternatives, have shown that we are nothing if very poor at choosing the option that suits us best. Anything can have an effect our choices: the style of music playing at that particular moment or the arrangement of whatever items you are choosing from. Defaults are one of the biggest influences, since often the majority of people decide to go with whatever default option has been predetermined. Despite being widely acknowledged and influential, Nudge is sometimes a bit of a bore. United States pension policy doesn't make for a exciting read for anyone, even actual citizens. For me, these parts were as uninteresting as ice fishing is cowboys. I could have skipped many chapters, but didn't mostly because "cheating" with books makes me nervous. 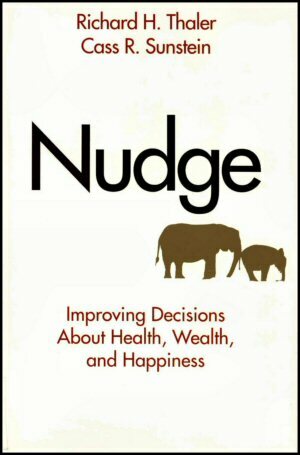 A strange thing about Nudge is that despite being only 5 years old, it does have an air of obsolescence to it. Many of the problems it mentions have already been resolved on some level, especially those that had not been previously implemented due to technological restraints. This may be more a testament to how fast the world has changed in the last 5 years than an actual problem for readability. It does, however, make some passages feel redundant. I'm not entirely sure, whether this should be required reading for all political hopefuls and future choice architects (IT-consultants, this includes you!). You might be better off reading one of the older magazine articles done when this book was released. The idea behind all of it is so simple: nudge people toward more sensible options, and you can make the world a better place.